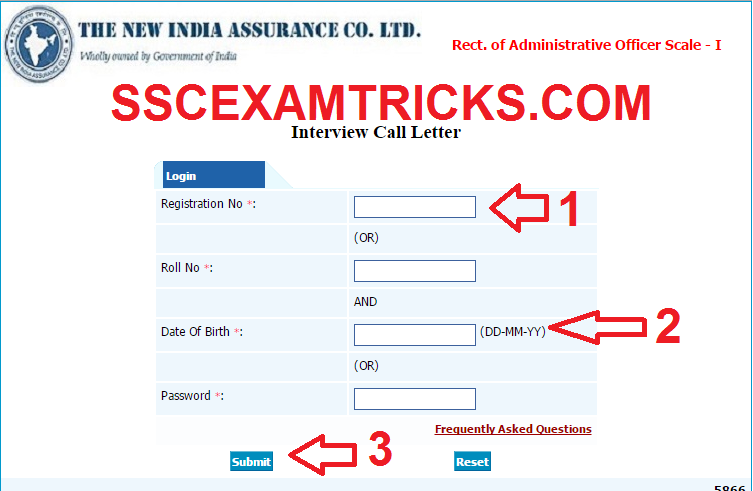 The New India Assurance Company Limited (NIACL) has released interview letters / interview schedule for 509 posts of Administrative officer Scale I in the various department in NIACL.The link for Interview schedule has been activativated on the official website of NIACL. The Interview will be conducted on the various dates (Alphabetic order of Candidates Name) from 3rd Week of February 2015 to the last week of March 2015. Interview letters of the short listed candidates has released on 09th February 2015 onward on the official website of NIACL. Earlier NIACL had successfully conducted Online Exam of NIACL AO EXAM 2015 for the posts of Administrative officers Scale I (Generalist and Specialist) on 10thJanuary and 11th January 2015 at various centres of all over the country.The Result of NIACL AO Exam 2015 had released for the posts of Administrative officers. The latest news is that NIACL AO is has released the result of Online Exam NIACL AO EXAM 2015. Those students who had appeared in Online NIACL AO EXAM 2015 and waiting for the result can download the result from the direct link provided below for the convenience of candidates. 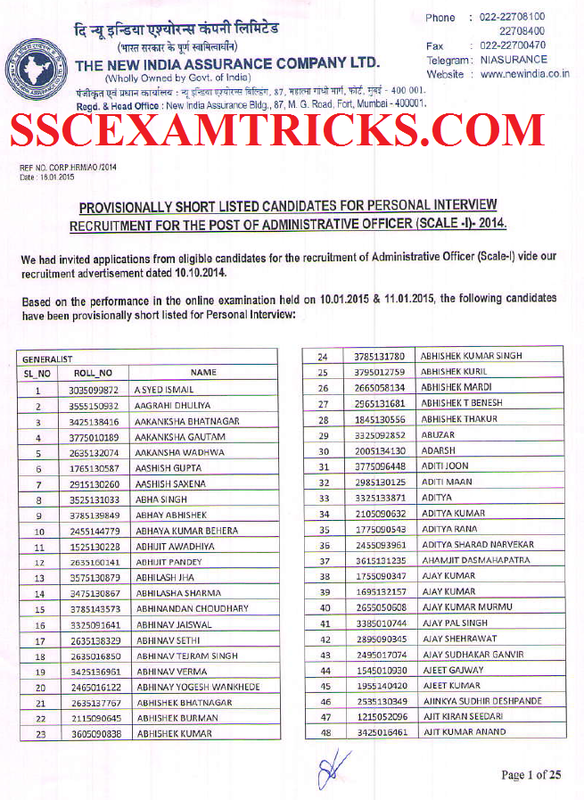 Download the result in PDF or List of Short Listed Candidates for interview stage. Save or Print the Result for Future references. NIACL AO Exam was conducted on 10th and 11th January 2015. The NIACL AO Exam was conducted by ONLINE MODE. The exam was entertained through filling of circles on Computer Generated Page containing answers by clicking by mouse on it. There was no OMR sheet needed to be filled by Blue/Black ball point pen. The exam consists of various sections English (50 questions of 50 marks), Reasoning (50 questions of 50 marks), Quantitative Aptitude (50 questions of 50 marks), General Awareness (50 questions of 50 marks). The exam was a multiple choice question paper of 200 questions of 200 marks and five options were provided out of which candidates need to choose one correct answer. The time duration was of 2 hours or 120 minutes. For more information candidate must download syllabus and exam pattern of NIACL AO exam from the official website. The exam consists of various sections English (40 questions of 40 marks), Reasoning (40 questions of 40 marks), Quantitative Aptitude (40 questions of 40 marks), General Awareness (40 questions of 40 marks) and Technical & Professional Knowledge (40 questions of 40 marks). The exam was a multiple choice question paper of 200 questions of 200 marks and five options were provided out of which candidates need to choose one correct answer. The time duration was of 2 hours or 120 minutes. For more information candidate must download syllabus and exam pattern of NIACL AO exam from the official website. The qualified or short listed candidates may be called for interview round. The weightage (ratio) of online Examination and interview will be 80:20 respectively. The combined final score of candidates shall be arrived at on the basis of scores obtained by the candidates in the online examination and interview. A Final Merit List / List of Selected Candidates will be prepared based on the performance in written exam and interview. The List of Selected Candidates will be released on the official website of NIACL.